This article is about Wikimedia Project. For the term "commons" in political economics, see commons. For other uses, see Commons (disambiguation). 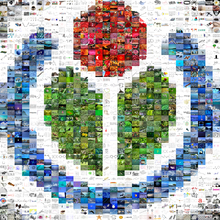 Wikimedia Commons (or simply Commons) is an online repository of free-use images, sounds, other media and JSON files. It is a project of the Wikimedia Foundation. Most Wikimedia projects still allow local uploads which are not visible to other projects or languages, but this option is meant to be used primarily for material (such as fair use content) which local project policies allow, but which would not be permitted according to the copyright policy of Commons. Wikimedia Commons itself does not allow fair use or uploads under non-free licenses, including licenses which restrict commercial use of materials or disallow derivative works. For this reason, Wikimedia Commons always hosts freely licensed media and deletes copyright violations. Licenses that are acceptable include the GNU Free Documentation License, Creative Commons Attribution and Attribution/ShareAlike licenses, other free content and free software licenses, and the public domain. The site has three mechanisms for recognizing quality works. One is known as "Featured pictures", where works are nominated and other community members vote to accept or reject the nomination. This process began in November 2004. Another process known as "Quality images" began in June 2006, and has a simpler nomination process comparable to "Featured pictures". "Quality images" only accepts works created by Wikimedia users, whereas "Featured pictures" additionally accepts nominations of works by third parties such as NASA. A third image assessment project, known as "Valued images", began on June 1, 2008 with the purpose of recognizing "the most valued illustration of its kind", in contrast to the other two processes which assess images mainly on technical quality. The site held its inaugural "Picture of the Year" competition, for 2006. All images that were made a Featured picture during 2006 were eligible, and voted on by eligible Wikimedia movement members during two rounds of voting. The winning picture was a picture of the Aurora Borealis over snowlands, taken by an airman from the U.S. Air Force. The competition has since become an annual event. ^ Yurik (November 2019). "Help:Tabular Data". Commons.wikimedia.org. Retrieved March 29, 2019. ^ a b ÄŒesky (July 15, 2013). "100,000,000th edit". Commons.wikimedia.org. Retrieved August 22, 2013. ^ "Commons:Project scope". Wikimedia Commons editors. Retrieved January 26, 2014. ^ "FlickrLickr image upload count". tools.wikimedia.de. Retrieved July 30, 2017.